"I'm like a duck, calm above the water and paddling madly underneath," said Darolyn Butler about her state of mind on Friday, June 25th. It iss the day before the Western region selection trials for the U.S. Endurance team. 17 of 19 horses presented had vetted through, and Darolyn had a double reason to worry. She had a hopeful member of the Namibian team, Anna Wucher, riding her second qualified horse, DJB Cherry's Juliet. She was not the only one who was preoccupied with the upcoming ride. "You think about it every waking hour," said California rider, Kassandra DiMaggio. The pressure comes not just from the rigors of the 80-mile ride they'll be attempting, but from the fact that every move will be scrutinized by the Enduramce Chef d'Equipe, Becky Hart and her five selectors, all endurance riders with international experience: Roger Yohe, Cathy Davis, Anne Stuart, Alex North and Linda Howard. Even if you have years of experience or have ridden on teams with the selectors, there are no givens, because they have to chose the horses and riders with the best chance of winning a medal. "I have a crisis going on at home," Darolyn said, "but you have to put that all aside." Home is a long way away. She's based in Texas at Cypress Trails Equestrian Center. Other riders have come from Utah and California, as well as throughout the Pacific Northwest states, and they have been traveling to FEI qualifying rides since 2008. I thought of the distinction ride vet Dr. Mike Foss drew for me at the PNER convention between the average AERC endurance rider and a typical FEI rider, who is aiming at international competition. 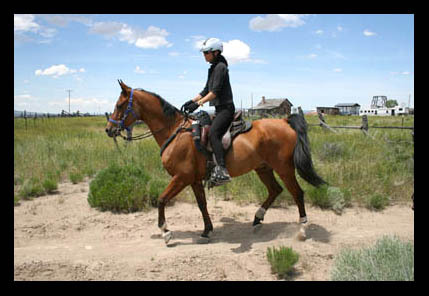 "Most of you enjoy endurance riding as a part of their life. For the FEI riders, it IS their life." That is especially true because most top level riders run businesses around their endurance riding in order to sustain their activities. I chatted with Christoph Schork and Tennessee Mahoney as they hand-grazed their horses, Stars Aflame and TC Moonshine. "I'm usually on Facebook between midnight and two a.m.," he said. "That's because the other twenty-two hours you are on your horses," Tennessee pointed out - only a slight exaggeration. The relationship with the horse that develops is critical to success. "When you spend that much time with them," Christoph said, "it's different than a show jumping rider, who is on each horse for an hour a day. " Start of the ride was to be at 8am about 2.5 miles from ridecamp out to another wide spot in the road…..not kidding. Crew needed to be in place prior to the riders leaving. Groups left at 20 minute intervals. MONK and Lindsay were in group one which consisted of 5 riders. Jeremy and Heather Reynolds, on Smitty and Sam, riders Carolyn Giles, and Cheryl Dell rounded out the team. They were first on the coarse at 8am. All crewing must stop when in the pulse box. Horse is then presented to the team of vets who check everything, including temperature. Trot out and CRI are recorded. Lace has gone on to become a top New Zealand Endurance horse, winning the “Distance Horse of the Year” award in the 2008-09 season and is poised to win the title again this year with five wins and three top-three finishes out of eight rides. Together Lace and Jenny have completed two FEI (FEI are international classed events) 160km rides, both in times which qualify them to compete at the World Equestrian Games in Kentucky, USA. CODY — As the night wore on, the pale sliver of crescent moon slipped away, leaving the horsemen barely able to pick their way through the darkness along the remote trail. But they pressed on, determined to deliver a pouch stuffed with urgent messages. Worried that he would be late in delivering the mail to Sweetwater Station, rider Mike Strain urged on his mare, Willow, anxious to hand off his precious cargo to new riders. Strain, a South Fork Valley ranch manager, is one of more than 600 riders participating this month in a re-enactment of the Pony Express, 150 years after it was created as a way to connect the growing state of California with the rest of the nation. National Helmet Awareness Day will be Saturday July 10th. Check this page on a regular basis for details regarding events to be held that day and also for a list of retailers that will be offering discounts on helmet purchases that day. Participating manufacturers to date include: Troxel, Charles Owen, Aegis (Devon-Aire) and GPA. If you are a retailer that sells helmets from one of these manufacturers in your store, please contact the manufacturer directly for details of the promotion. Kentucky Horse Park – we will be hosting an event at the Kentucky Horse Park on this day. Want to hold your own event to mark the occasion at your barn/facility? We can provide you with graphics for flyers etc. Please contact us for assistance and to let us know you are holding your own event. Participating Retailers (offering a discount on helmets purchased on July 10th). This list will be updated daily. KBC Horse Supplies, 140 Venture Court, Lexington, KY 40511. KBC Horse Supplies, 7500 Turfway Road (Stable Area), Florence, KY. The American Competitive Trail Horse Association is proud to announce that the annual "Ride for the Rescues" benefit trail ride held across the country over the weekend broke a Guinness World Record for the world's largest trail riding competition. Hundreds of dedicated ACTHA volunteers, and approximately 1700 riders raised almost $70,000 during this benefit ride, which will be used to benefit horse charities and rescues nationwide. ACTHA, is a true leader in the horse industry for recognizing and celebrating the value of the great American trail horse. Each year, ACTHA sponsors hundreds of rides across the country in an enjoyable and casual 'six mile - six judged obstacle' format. The goal is to provide a casual, fun venue to showcase horses of all breeds while at the same time raising funds for equine charities. To date ACTHA, with the support of their affiliates, has raised more than $300,000 to support equine charities. For this ride, Tom Scrima, general manager of ACTHA, called on volunteers to coordinate the largest ride the group has sponsored. About 700 volunteers and 1700 horse and rider teams met the call, and arranged "Ride for the Rescues" competitions at locations across the country on June 13th. Scrima said, "The 'Ride for the Rescues' marks a new era for horses and humans. We showed that coast-to-coast horse owners are willing to step up to the plate with their equine companions to help support horse rescue. The goal of ACTHA is to reduce the number of at-risk horses by creating 'jobs' for America's horses and equines. This ride was the first, giant step toward a day when there are no homeless or jobless horses in America". GOSHEN — A 16-year-old girl from the Goshen area is back home, recovering and “doing okay” after being struck by lightning while guiding a horse inside a barn last week, the mother of the girl told The Register Citizen. Codi Deakin, a boarder at Pie Hill Farm in Goshen, went outside just before 3 p.m. on June 10 to guide Neo, a draft cross breed, back into a barn for a lesson, said Romona Deakin, the girl’s mother. It was blue skies out, and while there were dark clouds in the distance it didn’t seem like there was any immediate threat of a storm, Romona Deakin said. Then, the lightning struck, taking down the girl and the horse. Emergency officials arrived and rushed Codi Deakin to Charlotte Hungerford Hospital where she was treated for non-life threatening injuries. Note: You can also come up Saturday morning. travel 17 miles east to Foresthill. is on the south shore. pants, gloves, suncreen, hats, etc. Tools will be provided. Several riders from Aiken will take part in what will be the one of the first Guinness World Records attempts for the largest trail riding competition at Lakeview Plantation in Fairfax. The South Carolina trail ride will be one of 61 held nationwide this Sunday, said Carol McElwee, an Aiken resident and American Competitive Trail Riding Association affiliate. All of the proceeds from the event will go to equine rescue charities throughout the country, said McElwee. The facility at Lakeview Plantation has space for camping and offers more than 100 stalls for people who come in for the day, said McElwee. The ride in Allendale County will be the only one in South Carolina that will be recognized as part of the attempt. "The lodge is filled, and the campsites are starting to fill," said McElwee. Lindsay Graham began riding horses as a young child and soon began competing in hunter/jumper competitions up through college. She was first exposed to endurance riding back in 1993 as crew member for her mom and horse Phoenix Affair. In 2004, roughly the time that she had to retire her horse from jumping, her mom needed to have surgery on her back. Lindsay decided to continue to keep Phoenix going for the year as she continued to ride in intercollegiate jumper shows. During that year, Lindsay became hooked on the sport of endurance riding and switched over to the sport in its entirety, leaving jumping in her past. Farzad Faryadi was born in Iran, but has been a US citizen for more than 20 years. He ventured into the world of endurance in 2001. Faryadi’s first endurance horse was a Quarter Horse, a breed not often seen in the world of endurance. Since 2001, Farzad has ridden nearly 5,000 miles in competition and completed 132 rides. Equine Land Conservation Resource (ELCR) is pleased to announce an important new web resource for horsemen and landowners. The Equine Activity Statutes and Recreational Use Statutes Directory is now available at www.elcr.org/ss2.htm. A crucial factor in equine access to land is often landowner liability protection. Liability is determined on a state-by-state basis, and in most states is governed by two sets of laws: Equine Activity Statutes and Recreational Use Statutes. In the past, this information has been hard to gather and difficult to interpret. ELCR recognized an opportunity to assist and support horsemen on this issue. Working pro bono, Holly Rudolph, a law student assembled an in depth spreadsheet showing both sets of laws listed by state and with a brief analysis. Julie Fershtman, J.D. and ELCR Advisory Council member served as an advisor for the project. The spreadsheet, found at www.elcr.org/ss2.htm, provides a single source to view and compare statutes by state. ELCR and other organizations had gathered this information before, but as the laws changed, the documents quickly became outdated. Because this site provides live links to the statutes themselves, the information will remain current. In addition to the live links, the Directory provides analysis of the statutes. Details provided include things such as whether or not charging a nominal fee for access will reduce or destroy a landowner’s liability protection and whether specific language is required on signage as outlined by statute. The Equine Land Conservation Resource is the only national not-for-profit organization advancing the conservation of land for horse-related activity. ELCR serves as an information resource and clearinghouse for land and horse owners on issues related to equine land conservation, land use planning, land stewardship/best management practices, trails, liability and equine economic development. If you want to know more about ELCR, visit our website at www.ELCR.org or call (859) 455-8383.